Hopefully, if you read my last post about fur, you are now thinking of great alternative fabrics for warm clothes. Before you make any purchases, I would like to remind you all that wool is not a cruelty-free alternative to fur. Since sheep need to be shorn to remove their excess wool, people don’t really see anything wrong with the wool industry. But, just like many other industries that depend on animals for profit, the wool industry has a cruel and dark side that needs to be exposed. Many people believe we are doing sheep a favor because they need to be sheared. This is a myth. Wild sheep grown enough wool to protect them from themselves from the winter and keep cool in the summer. They shed their winter coat naturally and do not need to be sheared. Domesticated sheep have been selectively bred to have thick and heavy coats. 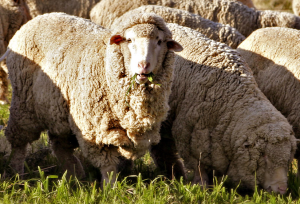 In Australia, where 30 percent of the world’s wool is from, the most common sheep is the Merino. Merinos have been specifically bred to have wrinkly skin to produce more wool. Unlike wild sheep, they cannot shed their fleece and their coats are so thick that some die of heat exhaustion. Due to the wrinkly skin which contains skin folds, the wool collects unnatural amounts of urine and moisture. This moisture build up attracts flies to lay their eggs. Once the eggs hatch, the larvae feed on the sheep. This is called “flystrike.” To combat flystrike, mulesing is used. Mulesing involves slicing cresent-shaped slices of skin from the buttock area of lambs to produce scar that is free of wool. This reduces incidence of flystrike around the buttocks, but not for the rest of their bodies. Mulesing is all done without pain killers or anesthetics. Here is more information on mulesing. Sheep are shorn in the spring, before they would naturally shed their winter coats. To get all of the shearing done in time, it starts at a time that is not healthy for the sheep. 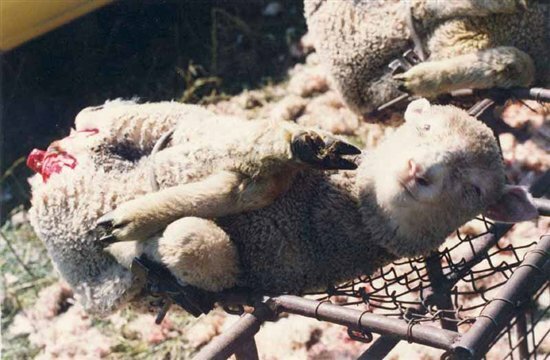 As a result, an estimated one million sheep die from exposure to the weather after premature shearing. Once sheep age and their wool production declines, they are sold for slaughter. This results in the cruel live export of more than 7 million sheep every year from Australia to the Middle East and North Africa. In Europe, the tightly packed animals are subjected to long-distance trips without food or water. Their final destination is frequently a country with minimal slaughter regulations. high-density fleece with four times the wind resistance of wool that also wicks away moisture. Be aware of other types of wool such as mohair, pashmina, shahtoosh, or cashmere. No matter what it’s called, any kind of wool means suffering for animals. Also, buy clothing from retailers that have pledged not to sell Australian Merino wool products until mulesing and live exports have ended. These retailers include American Eagle, Abercrombie & Fitch, Aeropostale, H&M and Limited Brands. What do you think about the wool industry? Did any of this information surprise you? This entry was posted in Animal Rights and tagged Genetic Manipulation, Live Export, Mulesing, Shearing, sheep, wool, Wool Industry by schinch1. Bookmark the permalink.